In our last blog article we expanded on the introduction of our NITRO™ technology layer by discussing the role of User Interface & User Experience in our product family. When it comes to User Interface, the focus is on functionality and the user’s interaction with a digital environment. In short, we want our products to be easy-to-use while addressing core business needs. User Experience is a wider umbrella that includes not only usability, but also branding, colors, layout, and navigation. Although UX consists of multiple variables, the standards by which “good” UX is measured are fairly simple: Were the users able to easily use the application? Did they enjoy using the product? The tandem of UI & UX is one of the core pillars of our NITRO™ back-end technology layer and plays a significant role in expanding the native functionality of Microsoft SharePoint and Office 365. NITRO™ transforms them from communication & collaboration platforms into highly relevant, and configurable, business application platforms. NITRO was developed in two versions, SharePoint 2013/2016 on-premises and Office 365. Each one adheres to the development guidelines and Microsoft standards for its environment. For example, NITRO for Office 365 is 100% native to Office 365 and uses no legacy on-premises code. Our NITRO™ layer is founded on core ITSM principles and, from a software development perspective, is manifested in the form of “Three Pillars of Application Design”: UI & UX, Workflows & Processes, and Reporting & Analytics. These aren’t three arbitrary ideas but, rather, are seamlessly integrated features. In a nutshell, they represent our development philosophy. How to Make UX Intuitive? We start with UI & UX because all products need to be engaging, easy-to-use, and intuitive. Being “intuitive,” though, is often easier said than done — how can a solution be relevant to your business needs? We address the challenge of being intuitive and relevant by providing a high degree of configurable functionality in our product family. For User Engagement, this means that you can select, specify, arrange, and present content as you see fit. For example, clients who use our Facilities Management system can brand the product to fit their company’s look & feel as well as customize dashboards to include tables, charts, and forms. 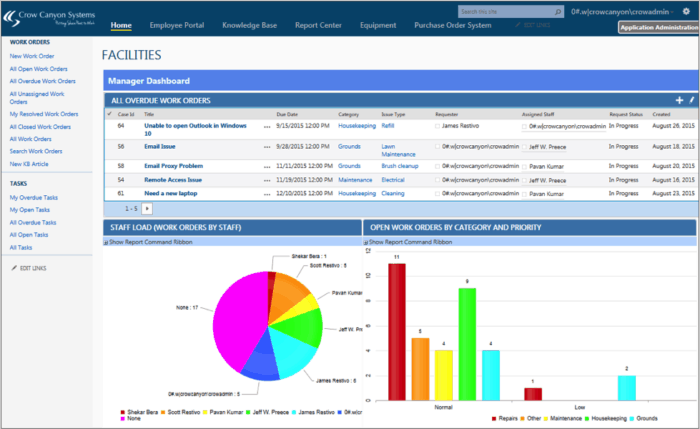 In the Facilities Management dashboard graphic below, the content has been customized to convey critical information at-a-glance, such as an overdue work orders table, a staff load pie chart, and a filtered open work orders bar chart. An intuitive product gives you the power to craft the user experience, with the ability to modify and adjust as users give their feedback or the application expands usage. Beyond the interface and experience lies functionality: how do you use the product? The business requirements addressed by the Crow Canyon product family rely heavily on process-based actions. 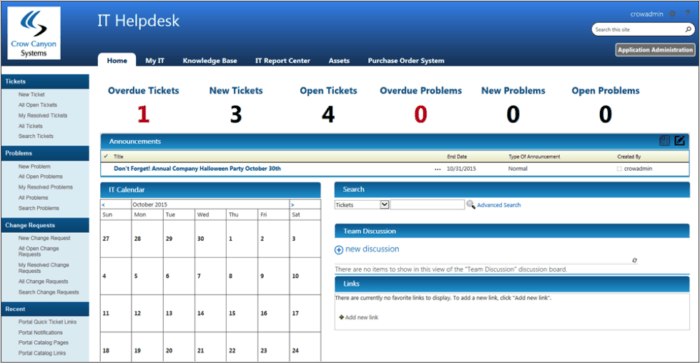 For example, our IT Help Desk system guides support specialists through the ticketing process: users create a ticket (from e-mail, SharePoint, telephone, etc. ), Support personnel capture more information via forms, the ticket is sent to the appropriate recipient, knowledge bases are accessed during resolution, the ticket is sent for approval, and the requestor is automatically notified of the resolution. The entire process is tracked, captured, and made available for subsequent analysis. This Workflow & Process-oriented approach, like UI & UX, is entirely configurable. Our products empower companies to create their own processes based on how the company works. This level of flexibility is unique in the IT world because it shifts attention away from forced adaptation to user-defined experiences. The relationship between UI & UX and Workflows & Processes is a seamless one: the former is focused on how we experience a product while the latter emphasizes how the product is used. For example, our products support a functionality called Dynamic Tabs and Dynamic Fields. Both of these functions — used when creating forms — represent the marriage of UI & UX with Workflows & Processes. 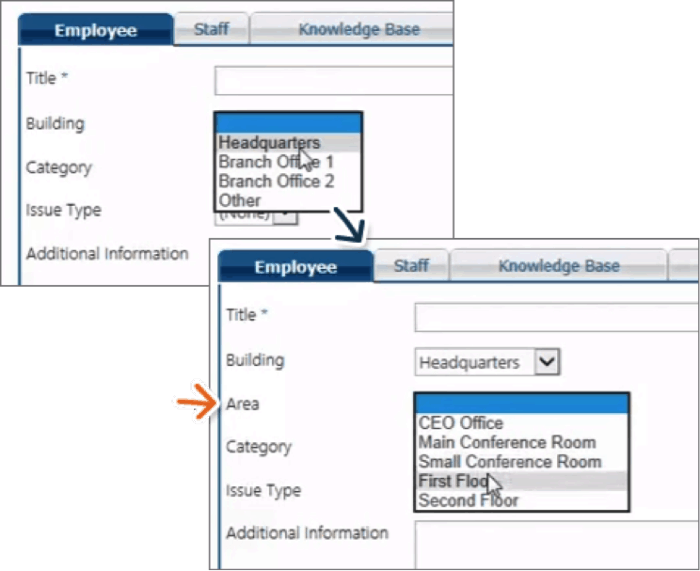 The Dynamic Tabs feature creates a new tab when a specific option is selected from a drop-down menu; this enables organizations to build robust forms that automatically expand or contract based on user selection. 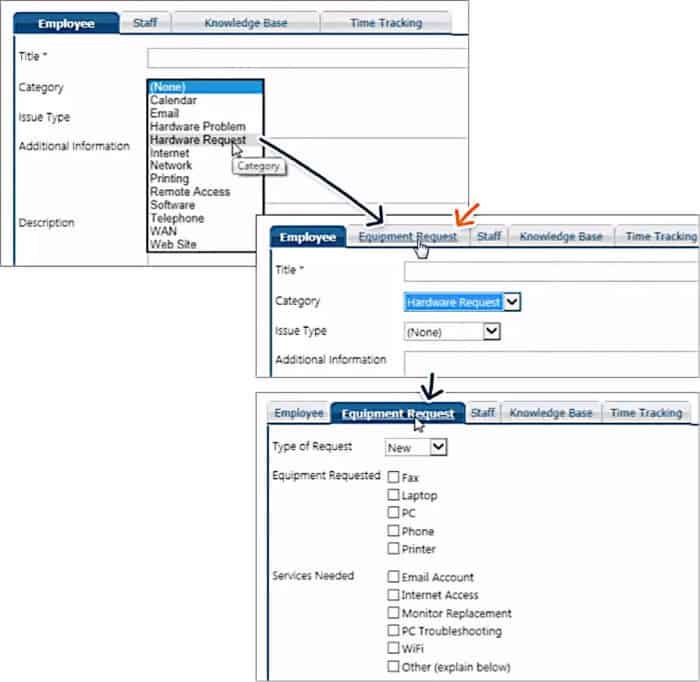 In the example below, selecting “Hardware Request” from the Category field automatically creates a new tab called “Equipment Request,” which enables users to input more refined data. Both of these features are examples of how our products empower organizations to use UI-based functions to deliver engaging Workflows & Processes. This level of configurability is applied throughout all of our products, effectively allowing you to build your own business application experience in a Microsoft SharePoint or Office 365 environment. 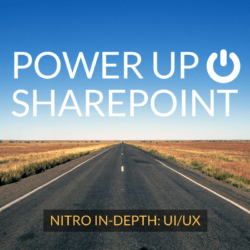 Over the next few weeks we will explore NITRO™ in more depth and look at how its Three Pillars (UI/UX, Workflows & Processes, and Reporting & Analytics) are used to bolster your SharePoint or Office 365 experience. Also, don’t forget to register for our upcoming User Interface / User Experience Webinar (October 6th) to learn more about how User Engagement impacts our NITRO™-powered business solutions. Crow Canyon’s NITRO™ is a back-end technological layer that forms the foundation of our SharePoint and Office 365-integrated solutions. With our NITRO-powered applications, you no longer have to settle for run-of-the-mill, standardized SharePoint or Office 365 environments that do not meet your business needs. Instead, you can turn SharePoint and Office 365 into “Digital Workspaces” where users can engage and interact with each other to further the goals of the organization, whether aiming for more efficiency, higher profits, or better service to customers, clients, and members. We use our NITRO™ layer to extend the functionality of SharePoint and Office 365 without requiring any coding on your part. Whether you need to manage assets, facilities, service requests, security access, or have onboarding requirements, our software is designed to intelligently address your business needs while engaging with your users in a comfortable and familiar environment. Our ITSM and ITIL-inspired approach to software development has played a significant role in the formulation of our NITRO™ technology layer. We have incorporated core service management concepts, such as incident, problem, and change management, into our NITRO™ framework. Reporting & Analytics: Visually engaging reporting tools that provide summary & detailed insight about how you can continually improve your services. Let’s go into more depth about User Experience/Interface and how our applications empower organizations to craft highly-relevant business solutions. 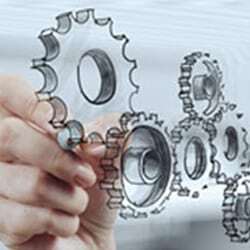 For example, our service management-oriented products all include a data-gathering phase of some sort. If you’re running the IT Help Desk, then incident details would be specified by your users; if you’re running our Human Resources product, then users would provide service request data (e.g., time-off request, onboarding, payroll issues, etc.). Essentially, there is always an initial phase in a workflow in which user-provided data is defined. Most off-the-shelf products do not support comprehensive field configuration; at most, they may provide a handful of custom fields. Our products, however, put the power to configure the data-gathering process into your hands. This enables you to craft a User Experience that reflects your company’s unique data collection requirements. In our solutions, fields can be customized, arranged, and populated as needed. New fields can added; the fields can be in tabs or groups. The forms are dynamic, responding to user input. They integrate with Active Directory and can be extended to work with databases, such as membership or account records, order tracking systems, CRMs, ERPs, HR programs, and financial systems. They include permissions (who can see what fields or tabs), required fields, input validation, default inputs, and more. Our reporting tools give staff and managers quick access to real-time data. Charts, graphs, and tables can be included on dashboard pages. Visual elements such as these provide both important high-level views and drill-down capabilities in an intuitive and attractive design. The high degree of configurability offered in all of our products means that you can brand your experience according to your own marketing, UI, and UX standards. The look and feel is fully customizable and the application itself is device-agnostic, meaning that your Crow Canyon product experience works responsively across all mobile devices. A “good” product experience is one in which a user enjoys using an application — functionality, whether its simple or complex, is both intuitive and easy-to-use. This approach to UX is facilitated by anticipating user needs: knowing what people require without having to ask. The Home screen from our IT Help Desk product, seen below, provides a good example of this straightforward UX technique. This particular interface is a dashboard screen designed to convey high-level ticket information. Its primary purpose is to provide critical status data for tickets, particularly for overdue issues. Current status information is conveyed horizontally across the screen in a large, easy-to-read font. Like other pages, the content and layout is entirely configurable — this sample displays a calendar, announcements section, search functionality, discussion area, and relevant links. Why discuss User Experience and User Interface even before functionality? Quite simply, if your users cannot engage with a product, then they will not use it. Whether your company is a startup or a large enterprise, user adoption is a significant issue in the IT space. Successful products are ones that combine intuitive navigation and easy-to-use functionality while reflecting your own unique branding. We feel that the most efficient way to promote user engagement is to provide UI/UX-aware products that can be fully configured, as needed. Ultimately, the NITRO™ framework is focused on providing you with business applications that significantly enhance your SharePoint or Office 365 experience. Crow Canyon recently announced a three-part webinar series with each session focused on one of the three pillars: UI/UX (October 6), Workflows (October 18) and Reporting (November 3). A single registration gives you access to the entire series. Register now. Check out Crow Canyon Software Today!